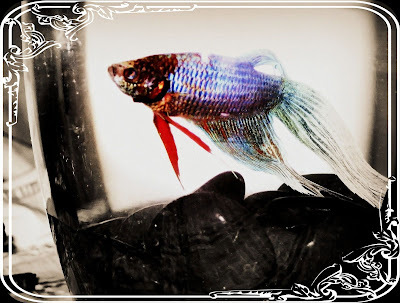 THE MARTIN KIN: In Memory Of Gordy The Fish! In Memory Of Gordy The Fish! Last night Gordy passed away. We aren't sure of the cause of death, but the other day we had broke his big bowl that he lived in and so we got a smaller bowl. We think it might of been the change of confinement. He was a wonderful lil friend and will be missed! Rest In Peace may your Heaven be full of beautiful clear water and your seaweed castle so big with lots of shinny pebbles! That is a way long time for a fish to live! I'm sure he had a long and full life!